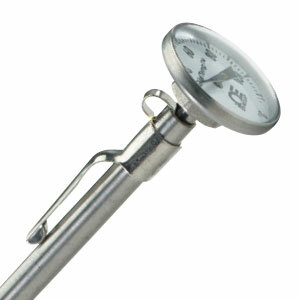 This handy little Pocket Thermometer is great for spot checking temperatures accurately and quickly. The clear easy-to-read dial with pointer directly driven by the precision sensitive bi-metal helix coil gives an accurate reading every time. With head and stem of stainless steel and plastic crystal and no mercury or glass, this thermometer is virtually unbreakable. The pocket case is constructed of plastic which allows it to be securely fastened to the pocket, preventing loss, yet keeping it easily accessible. Should the need ever arise for resetting the pointer, an external adjustment feature permits simple zero reset in seconds. This precision-built thermometer makes checking fluids, gases or semi-solids quick, easy, and exact. It can used for testing a multitude of materials in hundreds of fields, such as air conditioning, food processing, refrigeration, cookers, frozen foods, chemicals, radiators, meats, fish, fruit, incubators, milk and dairy products, dishwashers, soil, compost, water, and many other applications. Insert stem at least 2 inches into fluids and 4 inches into gases to obtain an accurate reading. The thermometer can be handheld in most applications; however, to avoid excessive heat exposure to hand, a “holder-loop” is provided on the clip at the top of the pocket case. Insert the stem through the loop, and the case becomes a holder for the thermometer. When inserting into semi-solid materials, such as frozen foods, soils, meat, fish, fruit, etc., hold stem firmly and insert slowly and carefully to avoid bending. Do not hold head when inserting-always hold stem. 참고: Normal Usage: Insert stem at least 2 inches into fluids and 4 inches into gases to obtain an accurate reading.